Hello foodies ! 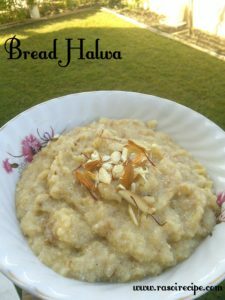 Today’s recipe is ‘Bread Halwa’. Sounds different and something new right? but it tastes yummy and very delicious. 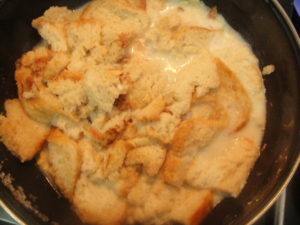 It is easy to prepare and the best part is you can make it rich or light as per your taste and need. 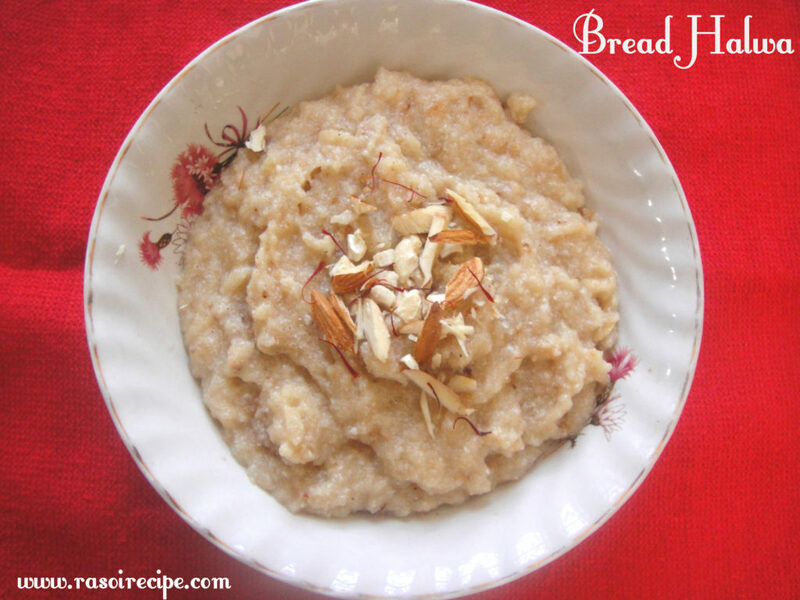 Basic ingredients for this dessert are bread slices, ghee (clarified butter), dry fruits, sugar and milk. 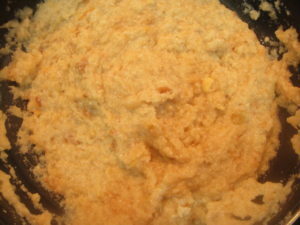 To make it more rich you can add khoya and deep fry bread pieces in ghee. 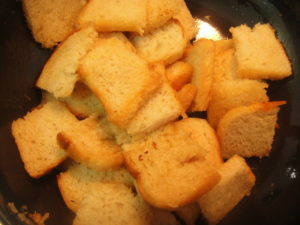 I am sharing very basic and quick recipe here. For more dessert recipes you can check Moong Dal Halwa (with a twist) , Mango Basundi (Aam ki Basundi) , Easy Eggless Chocolate Cake , Coconut Laddoo (Nariyal ke laddoo) , Seviyan Kheer Recipe , Peanut Ladoo (two ingredients recipe) , Gajar ke laddoo (quick carrot truffles) . 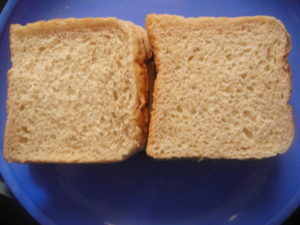 I am using brown bread slices, you can use white bread also. 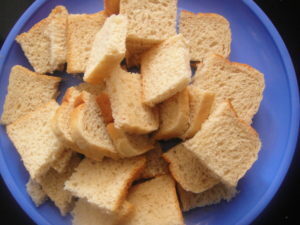 Cut slices in small pieces. 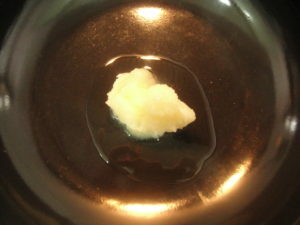 In a deep pan heat ghee (clarified butter). 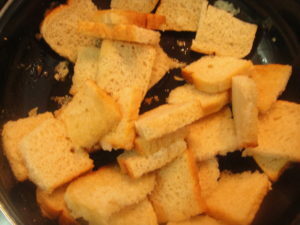 Add bread pieces and fry till golden brown in color. 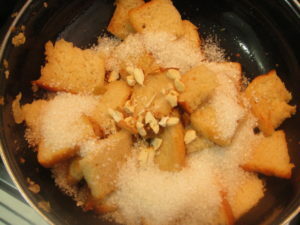 Add sugar, chopped dry fruits, cardamom powder and saffron strands, mix everything nicely. Lower the flame and immediately add milk. Bring it to boil on low flame. Cook everything till ghee starts separating from the sides. Garnish hot halwa with dry fruits and saffron strands. Oh wow it looks like oatmeal! Looks yummy! Alisha this looks so tempting.Never heard of a bread jalwa.Interesting concept.Would love to try it out. so tempted dish. loved it. Thanks for sharing.